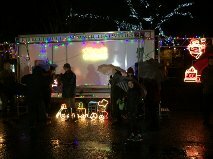 Christmas light switch on in Kirkcudbright. Albeit wet, cold and miserable, Philippa and I set off to be there for the Christmas light switch on and to see Santa in town. After some carol singing, in the rain the lights were on and if you drive through Kirkcudbright after dark I am sure you will agree they look splendid. 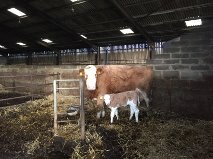 Our newest arrival to the herd is this lovely Simmental cross heifer calf. All set in Creel Cottage for a magical Christmas for our guests, baubles, tree glistening, tinsel hanging……..toasty and warm with that great sea view. Merry Christmas and a Happy New Year to everyone. Dairy House is all set for a cheery Christmas, with fairy lights, tinsel and baubles. Christmas cake on the side, ice cream in the freezers, and a few presents under the tree for our guests! Merry Christmas and a Happy Healthy New Year to one and all. What a great picture of the lovely robin perched on the wooden fence just beside Creel Cottage. 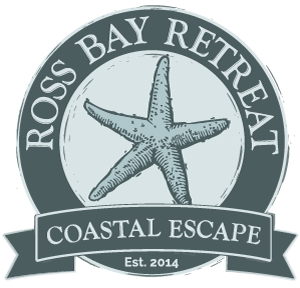 Winter is here, some whistling winds, wet rain blowing, and rough seas, but some shelter down at Ross Bay by the trees. Stunning views over the Mull of Ross towards the west. 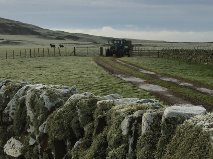 A little dusting of snow for the perfect country winter scene. Lovely walks over by Kirroughtree, and Newton Stewart. Whilst we were out on a family walk in the frost on Miekle Ross we were lucky enough to spot some deer and Stephen just managed to capture this one on camera – wonderful wildlife at Ross.